In TNG: "Coming of Age" there is a question about the matter/antimatter intermix ratio in Wesley's exam. Wesley quickly answers this question that there should be only one correct ratio, 1:1. But if we look at the principle of the warp core, there appears to be a flaw in his consideration. The warp power generation is based on the mutual annihilation of matter and antimatter. The key component of the system is the dilithium crystal inside the warp core. Being "porous" to antimatter, the crystal allows a controlled reaction of matter and antimatter to energy. Each deuterium atom reacts with exactly one antideuterium counterpart. At a ratio of 1:1, there would be nothing but pure energy left of the two initial materials. But where does the warp plasma come from? Plasma is excited matter, and it is required to transfer and distribute the generated power to the nacelles and other parts of the ship. We can presuppose that the plasma runs through the ship in a closed loop and that pure energy is released from the nacelles into subspace to create the warp field. There will always be a certain loss, but for the most part the matter would probably remain inside the system (unless the "used plasma" from the warp power system is fed into the impulse reactors for which there is no evidence). In order to work like this, however, we would expect the warp core to have an inlet for exhausted plasma flowing back from the nacelles. But something like that is missing in any schematics we have ever seen, most notably the ones in the TNG Technical Manual (TNGTM). Moreover, no propulsion system ever seen on screen seems to have something like a dedicated feedback tube. Nonetheless we may and we should assume that the exhausted plasma, basically just hydrogen, is fed back into the warp core. But then it would still add to the matter-antimatter ratio. Instead of an exact 1:1 ratio, it would rather make sense if the amount of matter were at least insignificantly larger than of antimatter, to form the basis of the plasma and also, for reasons of safety, to go sure that all injected antimatter is being annihilated. In fact, Leah Brahms complains in TNG: "Galaxy's Child" that Geordi has changed the ratio she designed the warp core for. The TNGTM does not mention why, but states that there are indeed greater ratios than 1:1 (although we get the impression this refers to "fresh" matter only). The book mentions a standard ratio of 10:1 for power generation which is gradually lowered for higher speeds. Only above Warp 8, it will eventually become 1:1. While the above problem of generating the plasma and avoiding an antimatter surplus remains above Warp 8, this suggestion makes sense if the amount of plasma stays the same, whereas the total amount of power and therefore of particles per time would have to be increased for higher warp factors. Thus, the matter-antimatter ratio would decrease. It might be different though, in that the amount of plasma could be increased proportionally to the injected matter and antimatter, so the ratio would always stay the same. Both is possible, considering that the amount of power generated is incredible anyway. A deuterium atom (one proton, one neutron) weighs 3.349*10-27kg. E=mc2 gives us an energy of 2*3,014*10-10J if one deuterium and one antideuterium atom annihilate each other. With the relation E=3*kT/2, this would result in a temperature of 1.456*1018K (that's really hot!) if two additional deuterium atoms per generated pair of photons are heated up with this energy. k is the Boltzmann constant. Of course, this is a very rough estimation and should be taken with a grain of salt. I am assuming two generated photons per atom pair, an ideal gas and otherwise ideal conditions without any loss, and not an indirect and "dirty" reaction as in the photon torpedoes. The intermix ratio in this case would be 3:1. Another argument in favor of a matter-antimatter ratio larger than 1:1 is that the deuterium tank of every starship is much larger than the antimatter containers (assuming that the antideuterium is not considerably more compressed than the deuterium which would make no sense for reasons of safety). It may be argued that the large amount of deuterium is primarily used for the impulse reactors (as the tank is definitely shared between the two systems), but carrying so much more fuel for a much less powerful system does not seem to be very efficient. More likely the impulse power is only a by-product of the impulse propulsion system and not intended to power considerable parts of the ship. Therefore, no huge tank would be included especially for this system. Once an antimatter-powered ship gets destroyed, we would expect the antimatter storage pods to blow in a large-scale explosion similar to that of a nuclear bomb and possibly much more destructive than a photon torpedo. This seems to happen in TNG: "Contagion", "Cause and Effect", "All Good Things", DS9: "Emissary" and "Star Trek Generations". In DS9: "The Ship", on the other hand, a Jem'Hadar fighter shoots down the runabout our Starfleet heroes were on. They see the runabout disintegrate in the atmosphere, but there isn't really a big explosion. In DS9: "Rocks and Shoals", the Jem'Hadar vessel crashes, and again there is no big kaboom. In ENT: "Canamar", the Enolian prison transport is destroyed when it breaks up in the atmosphere, and there is no apparent concern about a large-scale antimatter explosion in the atmosphere. We may imagine that in some cases the antimatter pods are jettisoned in time, at latest a couple of milliseconds before the shockwave of the explosion arrives, which might be sufficient to keep them from blowing. And even If the antimatter pods are not ejected by a dedicated mechanism, it is still possible that the impact of the shockwave hurls them away before they can break up. If we assume that the pods do not necessarily explode, perhaps the remaining amount of antimatter in the warp core is small enough not to cause a huge explosion. On the other hand, warp core breaches, if they are not stopped before the antimatter gets in contact with matter by restoring the confinement of by ejecting the core, are always catastrophic, and there doesn't seem to a possible scenario of a limited explosion. 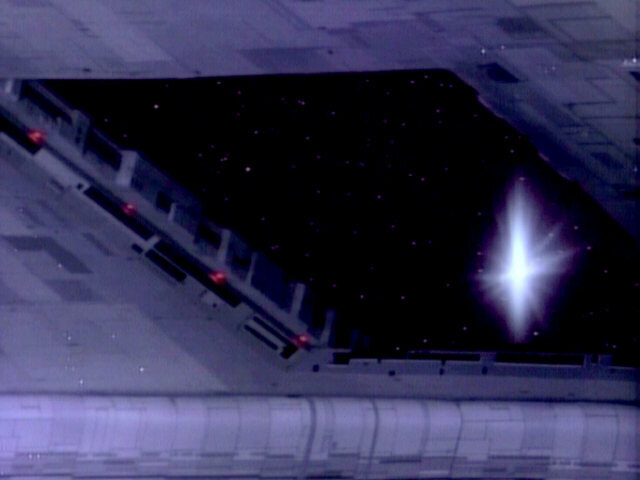 In the above cases the warp core most likely couldn't be ejected in time. Whenever a Star Trek ship is at warp, it seems that always several stars are flying by when looking at the main viewscreen or out of a window. The effect was probably created only to emphasize the high speed of the ship. It is quite obvious that these "star streaks" can't be actual stars, because even at high warp a ship would pass by only one or two stars per hour but definitely not several stars per second. Here "passing by" means that the relative angle changes by more than 90 degrees, resulting in such an effect like the "star streaks". Star streaks in TNG: "The Child"
We have to find another explanation for the phenomenon, and one may be Cherenkov radiation. Similar to the sound cone as produced by a supersonic aircraft which overtakes its own sound, a starship moving faster than light would create a sort of light cone. At least the shape of such a cone would exactly match the paths of the star streaks which always emerge radially from the center of the screen or window. Maybe parts of this cone would be visible from inside the ship as streaks for some reason. Another, even simpler explanation may be that interstellar particles glow because of the friction with the field created by the navigational deflector. Although it is definitely possible, there seem to be very different opinions whether it is advised to go to warp inside a solar system. In "Star Trek: The Motion Picture" Kirk speaks of the risk of engaging the warp drive while still in the Sol system. Dax advises against going to warp inside the Bajoran system in DS9: "By Inferno's Light". In ENT: "Demons" T'Pol is worried ("Inside the system?") when Paxton orders the mining facility to go to warp. In TNG: "The Best of Both Worlds" we even see the Borg ship as well as the Enterprise-D slow down to impulse, although several seconds longer at warp speed may have saved precious time. ...but slows to impulse in pursuit of the Borg. On the other hand, we have numerous incidents where warp drive is definitely activated inside a solar system without objections. 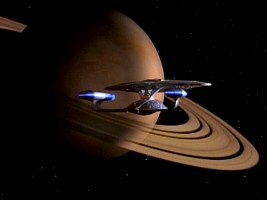 The Enterprise NCC-1701 goes to high warp in the Sol system in TOS: "Tomorrow is Yesterday" and pursues the Denevan ship heading for the sun at the emergency speed of Warp 8 in TOS: "Operation - Annihilate!". In TNG: "Symbiosis" the Enterprise goes to warp to help the Ornaran freighter, in TNG: "Descent II" Beverly orders to approach the planet with the Borg ship in orbit and drop out of warp only in the last moment. In DS9: "Past Prologue" the two runabouts traverse the Bajoran system at warp. Already Cochrane's first warp flight in "Star Trek: First Contact" naturally takes place in the immediate vicinity of Earth, as do the test flights in ENT: "First Flight". Enterprise NX-01 even goes to warp only a couple of seconds after leaving the dock in ENT: "Borderland". Likewise, in TNG: "11001001" we see through the doors of Starbase 74 (located in a planet's orbit) how the automated Enterprise-D warps away. There must be specific rather than general reasons why going to warp is unsafe in certain cases. Gravity may obstruct warp propulsion in the vicinity of a planet, but most likely the much higher concentration of particles inside a solar system poses a problem. Modern starships have a deflector for that purpose. Cochrane may not yet have been aware of the danger, and he may have just been lucky that nothing collided with his ship. Still, it is possible that the Phoenix already had a navigational deflector. Even with a deflector warp flight may be still a risk at high particle densities. In addition, it is possible that warp ships may endanger intra-system sublight traffic, so regulations may have been set up that generally disallow warp flight inside a (Federation) solar system. But this certainly wouldn't explain why staying at warp is not even considered an option in an extreme emergency, just like during the Borg incursion in BoBW. The approach in BoBW is also unrealistic because it could have been much easier to enter the Sol system perpendicular to the ecliptic, avoiding Jupiter and Mars instead of passing by the single planets. Any other starship entering a solar system can easily avoid planets, particles and sublight traffic likewise, almost immediately arriving at the destination planet, just as we have seen it countless times. Finally, there is one extreme case in "Star Trek: The Voyage Home" where Kirk orders the BoP to go to warp while still in Earth's atmosphere. While impulse inside the atmosphere may be hazardous because of the ionization, warp may pose no such problem. Still, it is questionable if the atmosphere provides stable conditions for a warp field, not to mention the air friction at extremely high speeds. In The Physics of Star Trek Lawrence Krauss discusses the amount of fuel required for impulse speed, based on the energy gained by the fusion reaction, and considering that mass significantly increases at relativistic speeds. His result is that much more fuel than the ship's mass is required to accelerate the ship to high sublight speed. Obviously Sternbach and Okuda took this consideration into account when writing the TNGTM, and they "invented" a subspace field generated in the driver coils, to lower the apparent mass of the ship. The book, however, also states that the subspace driver coil was introduced as late as in the Ambassador class (at least on an experimental basis), although it must have existed before, according to Krauss's calculations. We could either assume that starships always had these driver coils in the impulse drive (even at the time of Enterprise NX-01). Alternatively, the warp coils could have been used to generate a subspace field below 1 cochrane in order to achieve sublight propulsion or at least facilitate impulse propulsion. However, according to the TNGTM, the efficiency of the warp coils is reduced drastically below Warp 1 and therefore the warp drive would not be "wasted" for this purpose. The principle is put into practice in DS9: "Emissary". Here Jadzia proposes to create a low-level subspace field around Deep Space 9 to lower its inertial mass, so the thrusters could move the station from Bajor's orbit to the Denorios Belt in a matter of hours instead of days. In this exceptional case it certainly doesn't have to be the most efficient way of sublight propulsion. So it appears realistic, provided that the output is still high enough to reduce the mass of the station to an accordingly small fraction of its rest mass and not just by a few percent. How can a ship stop or quickly decelerate in space? The question sounds trivial, but actually we do not know how this is usually accomplished. What we know is that warp propulsion is non-Newtonian, meaning that it necessitates constant power input to maintain a constant speed. 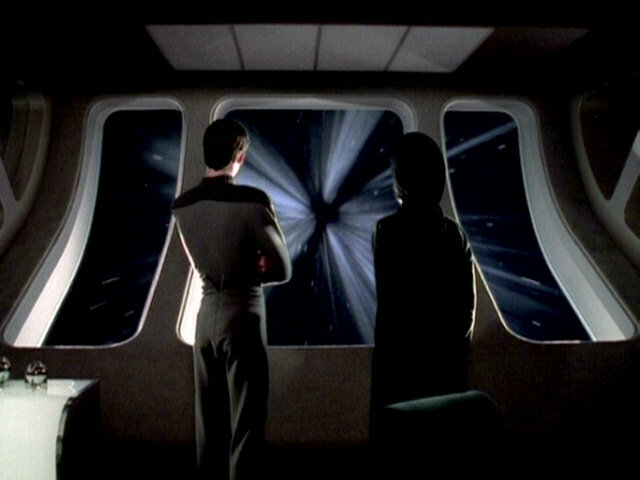 When the warp drive is either deactivated on purpose or when it fails, the warp field collapses immediately, which will cause the ship to slow down to sublight speed, as it was seen on screen countless times. In contrast, all other forms of (sublight) movement in space, using the impulse drive or thrusters, are Newtonian - the ship keeps its velocity vector as long as no force acts upon it. Well, at times it seemed as if the ship were actually stopping after turning off sublight propulsion, but I just assume that the camera was still moving together with the ship. With an impulse exhaust facing aft, as on all Federation starships, fundamentally only accelerating "forward" would be feasible within the laws of Newtonian propulsion. But how can a captain order a "full stop" or "full reverse" (such as Kirk in "Star Trek: The Motion Picture", when the warp engine control does not respond, or Harriman in "Star Trek Generations") and how can starships like the Defiant perform complicated maneuvers in a battle, involving frequent accelerations and decelerations at sublight speed? With only a one-directional impulse engine, it would make sense to use the thrusters to turn the ship by 180 degrees in the "horizontal" plane and later stop by using the very same impulse drive. However, except for Picard's unusual maneuver in TNG: "Booby Trap" where he made the ship yaw by briefly activating the thrusters and took advantage of the gravitational pull of an asteroid, we have never seen such realistic ship movements in space. We may find an explanation how the force of the impulse engines may be effectively reversed for deceleration. Something like a thrust reverser as on jet airplanes may be deployed to redirect the thrust. Or, since there does not seem to be anything mechanical or otherwise visible about it, a forcefield is erected to that end. Such a solution would be very asymmetrical and inefficient though, as the direction of the engines can obviously never be exactly reversed (which would direct the exhaust back into the reaction chamber or even into the hull!). The way it is mostly shown on screen, it would require a second impulse drive facing forward, preferably of the same size as the one facing aft, to enable the same acceleration in both directions. However, the only ship we have even seen firing forward engines to move in opposite flight direction was the Scimitar in "Star Trek Nemesis". Maybe the deflector dish is employed for that purpose on other ships? Or rather the RCS thrusters? But if the clearly much weaker RCS were sufficient, why would the ship still need big impulse engines for forward motion? It is also possible that the subspace driver coils of the impulse engines accomplish the deceleration. Without these driver coils, the impulse engine would be not very different to an ion drive as it is already on engineers' drawing boards or even to present-day rocket engines. There could be some strange effect that reverses the force on the ship if something is done with these coils, although this would strain the laws of physics quite a bit. On the other hand, according to the TNGTM, starships prior to the Ambassador class didn't even have these driver coils, but this is still another problem discussed above. The actual solution to the deceleration problem may lie in the ability of the driver coils to lower the apparent mass of the ship. Mark Temple points out that while a complete stop wouldn't be possible, the subspace coils may be the key to deceleration: "One of the more interesting effects such a scheme would have is that if the field were to be reduced, you'd loose momentum. The inertia the ship carries would be appropriate to the effective mass it was operating at. So a ship that reduced its effective mass via subspace fields to a tenth of its normal mass, if the field is dropped or reduced to almost nil, its velocity from inertia would also drop to a tenth of what it had been, since there is suddenly more mass for that energy to effect." Garret Beebe suggests a method that wouldn't even need subspace to work: "My hypothetical solution uses the research of Bernard Haisch, formerly of Lockheed's Palo Alto Research Center. In his paper The Zero Point Field and Inertia, Dr. Haisch and his colleagues theorize that inertia is in actuality an electromagnetic drag force experienced by a charge accelerated in the quantum mechanical zero point field. Without going into extraordinary detail for which I have no expertise, the scenario is as follows. As a point charge accelerates in one dimension through the ZPF, an asymmetry similar to the asymmetry created by a Casmir cavity is formed. This asymmetry manifests itself an electromagnetic field. Normally, the ZPF is undetectable because is it uniform in all directions. Much as a person immersed in a pool and lying completely motionless would not be aware of the surrounding water until he moves and experiences a drag force, a point charge would not be subject to a net electromagnetic force until it began to accelerate through the ZPF. When the charge accelerates, the asymmetry is created, and the charge can interact with the field according to Maxwell's Laws. The resultant force experienced by the point charge is equal but opposite to the force accelerating the point charge. This drag force is inertia. How does this relate to the problem of halting a starship? Because the ZPF is electromagnetic in origin, Dr. Haisch has proposed the modification of inertial mass using electromagnetic fields. He is currently in the process of attempting to detect a change in the inertial mass of electrons passing through a EM field such as a laser. For the purpose of starship operations, my solution is as follows. If we suppose that Dr. Haisch is correct, then inertial mass can be modified by the application of an EM field. If a starship fired its impulse engines to give it some momentum and then used the proposed 'driver coil' to create a suitable EM field, the inertial mass of the starship would decrease. Because of the conservation of momentum (mv = constant unless acted upon by an outside force), velocity would increase. By lowering the apparent mass, the starship could theoretically achieve very high speeds. To arrest this forward motion without reorienting the ship or mounting large bow impulse drives, one could simply eliminate this inertial damping field. As inertial mass returned to normal values, velocity would decrease. If the original velocity was only a few meters per second, the forward RCS thrusters could be used to arrest the remaining velocity. Some problems exist with my solution, however. If the field is applied to the whole ship, including the crew, how are normal actions such as walking affected. Would the reduction in inertial mass be apparent only to the an outside observer? Would the force applied by the leg muscles of a crew member to the deck send him bounding off the walls? Is the apparent strength of a crew member affected by a change in inertial mass of every particle in his body? Are the structural properties of the ship altered because of this change in apparent mass? Would material become weak because of EM induced changes in the bulk modulus? These are questions I am not prepared to answer. For the purposes of the fictional Trek Universe, I hope these issues can be overcome. This is my humble opinion in any event. For more on Dr. Haisch's work, please feel free to visit the following website: http://www.calphysics.org/zpe.html." Almost all ships we see on Star Trek are symmetrical, but usually only in port-starboard direction. If we look at them from the side, hardly any Federation ships or alien ships have the impulse engines located where we would expect them - with the thrust vector running through the ship's center of mass. The Galaxy class with its central impulse engine comes close to this requirement, and only few designs such as the Defiant look well-balanced with the engines placed in the centerline as seen from the side. The Miranda class and Nebula class, for instance, have impulse engines at the rear end of the saucer, but due to the supposedly heavy nacelles the center of mass is definitely located lower. Almost all these designs require corrections to the impulse thrust vector that could be accomplished by adjusting the impulse exhausts themselves or with the RCS thrusters. As a result, they have to deal with significant lever forces upon parts of the hull and the warp pylons that could be reduced to a minimum if only the impulse engines were located straight behind the center of mass. But exactly this may be one of the main reasons why starships need a structural integrity field (SIF). The problem would be essentially the same with warp engines, but due to their "exotic" working principle we are allowed to assume an intrinsic asymmetry, so we wouldn't really expect the nacelles to break off once the warp drive were activated. Whenever two starships meet, be it planned or accidental, be it of the same or two different civilizations, they always face each other "upside up". 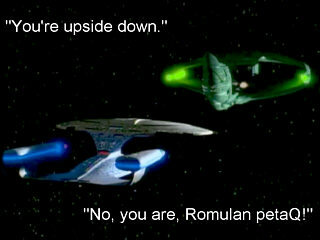 During early TNG, as depicted in The Art of Star Trek, Andrew Probert devised a new Romulan ship that was supposed to have an unusual vertical orientation (taller than wide) when facing the Enterprise, still, it was supposed to be "upside up" this way (the orientation of the Warbird design was finally changed to horizontal on Roddenberry's request). The real-world explanation for the upside-up rule is simple, because until a couple of years ago the special effects exclusively used motion control. Every starship miniature had one or more points where mounts could be attached, and they were usually on the ship's bottom - so showing one ship "upside down" might have required to damage the model or the double work of filming two sequences with opposite illumination to be copied together in a way that one of them would be upside down. It was as late as in the Dominion War battles that CGI starships allowed to be moved around in any curves and to be filmed from any angle. Ironically, the only two occasions (I know of) where a starship was actually turned upside down, a freighter in DS9: "Sanctuary" and the Sydney-class transport in DS9: "Trials and Tribble-ations", it was in situations where it would have made no sense. The Sydney class was obviously supposed to be a different class, but since I don't accept that, I now have to explain why the ship docked upside down... Another exception to the "upside up" rule is Empok Nor, which is always shown as tilted. This may be explained as purely artistic license to distinguish Empok Nor and Deep Space 9, as long as no other vessel is visible. But in DS9: "Empok Nor" the station is tilted even when seen through the windscreen of the runabout. The abandoned station has lost its attitude control, but there is no reason for the runabout not to match the "wrong" orientation of the station long before docking, the way it is done at any other station on any other occasion. Although there is no up and down in space, there must be a reason why ships always have a certain orientation either relative to each other or relative to the galactic plane, although during the flight they could rotate at any angle around their longitudinal axis. Basically, it would make some sense, at least for great distances, if starships moved in a way that the decks were parallel to the galactic plane, and if only for the right "feel" of the crew and in order to see as many stars as possible from the windows. On the other hand, instead of always traveling parallel to the galactic plane, a starship would have to "dive" very often, to reach a destination "above" or "below" the plane. Another possible explanation is that all space stations may have a certain orientation, and so do the starships. This, however, would make no sense for orbital stations, and again, it would be useless for empires whose territory stretches to regions "above" and "below" to the galactic plane. The only reasonable explanation in this respect is that there may be some sort of silent agreement between the major galactic powers (and even in the Delta Quadrant) that they turn their starships to match orientations when they meet. Maybe there is a rule that the smaller ship has to adapt its orientation to the larger one, too. A visitor named Shpenat suggests: "The warp engine needs to be coupled by inertial dampers. But from the scientific point of view there is no reason for inertial dampers to work other way than gravitational plating (from technical point of view there is a difference). So the ship with warp engine will definitely have artificial gravity. On the other hand transporter technology is not connected to warp propulsion in any way (and can be even unknown as in "Caretaker"). Let's assume we have two ships meeting in space. We want to send some personal from one ship to another. Than we have two possibilities: 1) shuttlecraft or 2) dock together. In both cases the smaller ship (shuttle) has to match the orientation of of bigger one. So after some time it may have become the sign of politeness to rotate smaller ships to match the bigger one. This is how the consensus about ship orientation may be known throughout the galaxy (This explanation does not hold in case of transporter technology being developed before warp)." The idea that it is a historical convention with technical reasons indeed makes a lot of sense. "Full stop" is a frequently issued command on Federation starships. Examples can be found as soon as in TOS: "The Corbomite Maneuver", also in "Star Trek II", TNG: "Encounter at Farpoint", "Where Silence Has Lease" (even three times), "Q Who", "The Emissary", "Tin Man", DS9: "Armageddon Game", VOY: "Persistence of Vision" and "Star Trek Nemesis". It is often criticized that "stopping the ship" doesn't make sense in open space. A speed and therefore as well a stop always need a point of reference. While we may easily explain a warp or impulse speed relative to the destination, a stop in open space doesn't seem to have a reference. However, the frequent criticism from people who entirely reject the possibly quite practical concept of a "full stop" is ill-considered and unfair, to say the least. Firstly, during the flight there must be permanent navigation references like stars, in order to verify and correct the course. There are probably various references in the form of near and distant celestial bodies. Hence, I can easily imagine that a full stop may be defined relative to such a nearby object. If the ship itself is moving at warp, the relative motion of stars would be minimal anyway, so I see no problem at all in the order "full stop". Secondly, on several occasions the ship had already slowed down or dropped to impulse to investigate something, so there was a quite definite reference, just like the buoy in TOS: "The Corbomite Maneuver", Q's "fence" in TNG: "Encounter at Farpoint" or the "hole in space" in "Where Silence Has Lease". Thirdly, the command doesn't even need to refer to the ship's speed, but it may simply imply to disengage the engines. Actually, in "The Corbomite Maneuver" Spock literally says "All engines full stop". In a similar case, Spock states in TOS: "The Doomsday Machine" about the USS Constellation in the solar system L-374 that she has "stopped in space. She appears to be drifting." This sounds like a contradiction, because "stopped" insinuates that the ship rests relative to the solar system (possibly on purpose), while "drifting" would mean that the ship maintains its last speed and direction before the propulsion system went offline. Maybe Spock is just unusually imprecise, and by "stopped" he intends to say that the ship is not on a reasonable course with a reasonably high speed, so it would be equivalent to being adrift. Or the ship really rests because the last thing Matt Decker did was to stop it, and "drifting" means that, in addition, the propulsion system is off. Thanks to Bas Gorris for some suggestions about the "unstoppable" ships, to Garret Beebe for his idea of using driver coils to decelerate the ship, to Matthias Stohr for a thought about the "star streaks", to Glenn Thacker for reminding me of the "warp inside the atmosphere" incident, to Robert Heckadon for the suggestion to comment on antimatter explosions and to johndmes for the thoughts about the impulse engine balance. Finally, Luke corrected an embarrassing error in the antimatter energy calculation.